A new session of Plant Sciences Seminar has been organized on this day 9th January 2019 in the conference room of the Laboratory of Genetics, Horticulture and Seed Science (GBioS). 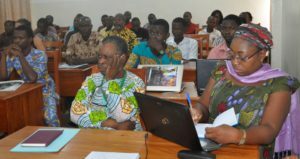 This section has involved the participation of most of the lecturers of the School of Sciences and Techniques of Crop Production of the Faculty of Agricultural Sciences of the University of Abomey-Calavi (FSA / UAC) and has been led by the Pro-Dean of the school, the Professor Ahoton Leonard. Like the previous sessions, this session has started by the shorter presentations called “My thesis in 5 minutes” which have been made by two speakers. The first speaker was Mr. Hervé DEGBEY, PhD student at Ebonyi State University, in Nigeria and Associated Researcher in the GBioS laboratory. 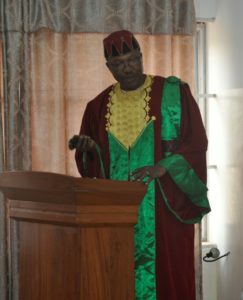 He has presented within 5 minutes his PhD research proposal focused on “integrated strategies for efficient management of BBTD and the enhancement of banana and plantain production in Benin and Nigeria”. Through the presentation the speaker has shared with the auditory the usefulness of integrating entomology and phytopathology approaches, for efficient screening of accessions of Musa spp., with the application of genomic techniques for detection of candidate genes to identify resistant genotypes against banana viral disease named Banana Bunchy Top Disease (BBTD) and the implementation of Participatory Plant Breeding approach for efficient sharing of cultivars among farmers’ networks in Benin and Nigeria. The second speaker, Dr. Bernice Bankole, has just graduated her PhD in December 2018 at University of Kwa Zulu Natal, in South-Africa. She has presented us her PhD outcomes focused on “screening strains of the Beauveria bassiana fungus for endophytic behaviour in sorghum, and biocontrol activity against the spotted stalk borer (Chilo partellus) and African pink stem borer (Sesamia calamistis).” The main issue she has tackled through her PhD researches is related to the devastating ability of the stalk borers feeding on two African staple food crops, rice and sorghum and on sugar cane and cause devastating crop losses of between 40% and 70%. Then she has sought for biological control of these stalk borers using the entomopathogen fungus. Her study has led to discover a number of strains of the fungus that live in the stem tissues for at least 60 days, and therefore have the potential to control stalk borers of cereal crops in Africa. Background knowledge in weeds’ science, understanding the establishment steps of Comelina bengalensis in local fields and find-out the strategy to reduce its propagation in major food crops in Benin. Through this presentation we have learnt that C. bengalensis has modified and dominated for long time the weeds’ population in Benin and has affected many crops yield. It deals well in the fallows where its population increases rapidly while in the cultivated field its population decreases. Understanding interaction between Rhamphicarpa fistulosa and its host plants: this weed is one of hemi-parasite that can adopt a latent form and can survive up to 50 years in the field when environmental conditions are poor. It affects many rice fields and can cause up to 80% of rice yield destruction. Its favor zones in Benin are the municipalities of Savè, Glazoué and Dassa. Understanding farmers’ perception and their knowledge on weeds in farming system in Benin: during this presentation, Professor Vissoh has shown us that in the most of case, farmers consider the damages caused by the weeds as the second constraint to their production due to their severity in farming system in Benin. However they have their own practices to manage and reduce those damages in their production system. Inventory of weeds associated to the onion production: we have learnt through this presentation the list and the ranking of the weeds found in the onion’s field and the evaluation of their severity. Afterward there was the last presentation on the research prospects on the weeds and the on-way research activities that are currently conducting in the laboratory. 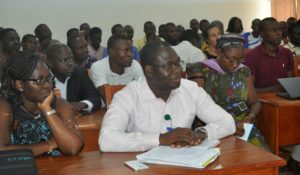 After the presentations, Professor Ahoton who was leading the session has registered the questions which were answered by the presenters and some comments have been made. Professor Ahoton has informed the auditory on the next session which will held on the 23rd January 2019 and the principal speaker will come from the “World Vegetable Center” institute. Onglet précédent Onglet précédent Molecular Biology Training & Open Labware Building Workshop at GBioSOnglet suivantOnglet suivantModern melon cultivars go back to two lineages in Asia and in Africa.